Its been a few weeks since I've worked much in my creative space and certainly that long since I've blogged it. I'm about to rev up again to sew some new skirts, mini mei tais and aprons for the next market, which I suspect may be my last for a little while... I must admit at this point in time, I'm lacking inspiration. I'm in a little rut of knitting squares and sewing things I know so well. I'm sure once I get the fabric out and start playing with colours again, it'll all seem like loads of fun all over again. Pop over to Kirsty's to join in or to visit some inspiring creative spaces. I know that feeling. I'm starting to learn that if I just *do* something, even something small, it's often enough to kick start some new creative energy. Good luck! Ruts have their own uses... but enjoy cracking the fabric out for a bit of a change. Gorgeous pile of ribbons. I hope you find some inspiration in there. I know that feeling of lack of inspiration. Hope it comes back when you are good and ready for it! Those ribbons are super cute. 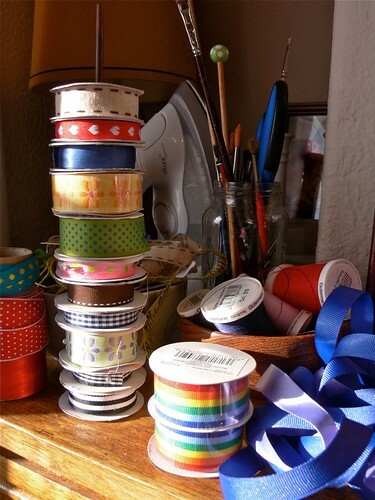 Gosh I love ribbons!